Deborah Richards is top Jamaican Woman! 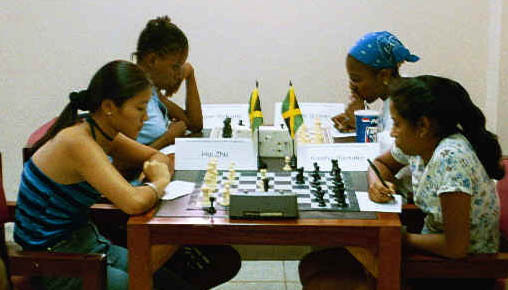 Bert Scott, "Deborah Richards wins KRY$ Jamaica Women's Championship," Jamaican Ambassadors Chess Academy. Deborah Richards of Wolmer's High School is the 2002 KRY$ FINANCIAL SOFTWARE Jamaica Women's Chess Champion. Ms. Richards finished with 8/9 points ahead of former champion Maria Palmer and Chinese sensation Zhu Hui who both had 7/9 points. Fourth was Vanessa Thomas. Deborah Richards scored the decisive win over Maria Palmer in Saturday's 6th round, and was helped by Camille Casserly's no-show in Sunday's 7th round. The top four finishers, Richards, Palmer, Zhu, and Thomas, all qualified for the Jamaica Olympiad team, and is expected to begin training immediately.